Paella, Sangria, and Churros! Oh My! Yes, you heard it here first: the Sixes are heading to Spain this summer! While this is a trip in every sense of the word (as opposed to my friend Emily’s upcoming 3-year “trip” to Belgium! ), we hope it’s a long-ish trip. My mother is Spanish, and most of that side of my family lives in Spain. That means we are doubly blessed with not only the means to finally make this trip a reality, but to have the opportunity to stay with family throughout Spain. We don’t have specific dates nailed down, but the hope is that we’ll spend at least 2 weeks there as a family, maybe with a side trip or two thrown in to England and/or France. Mike will have to return for work, but I’d love for the kids and I to stay for a few more weeks. 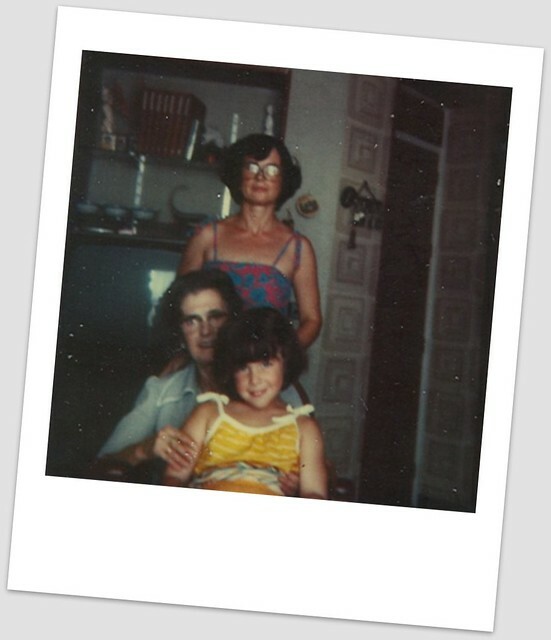 Me (age 6), with my mother and abuela, on my first trip to Spain. We’ve been dreaming about this trip for years, waiting for the right time. It finally feels doable – we’re not moving, I’m not working full-time, and the kids are at a great age for traveling. We have lots of planning to do (and mucho español to learn), but we’re super excited to finally have this bucket-list trip within reach. I can’t wait to share our adventures with you, just as I’ve lived vicariously through so many of your wonderful trips both near and far. As we plan, I’d love to hear from you. Have you ever been to Spain? More importantly, what are your best tips for traveling to Europe with kids? And who wants churros?! SOOOO JEALOUS! I can’t wait to hear all about the trip. My only tip is to download the Duolingo app for your phone. I am using it to learn Spanish! I am so incredibly excited for you! WOW. Serious envy but *right under* that is genuine glee. What tremendous memories for Elena and Eli. WOW.